Find Bigfoot photos and you may have evidence that this mythical creature exists. However, many hoaxes have been perpetrated when it comes to this legendary cryptoid. Once you know where to find bigfoot photos and images, you can start assessing if they are real or fake. Photos of bigfoot, often called yeti, sasquatch or skunk ape that are possibly real are rare. Is bigfoot an elusive species of a huge human/ape hybris roaming wooded areas throughout North America or just a fantasy or myth? A large section of the population seems to think so. This creature is one of the great legends of crytozoology, a branch of science that studies evidence of hidden creatures that have not yet been substantiated. Reports of bigfoot vary, but the creature is generally believed to stand seven to eight feet tall, and to weigh approximately 500 to 700 pounds. Although ape-like, the animal reportedly walks upright like a human, and carries a decidedly pungent odor. 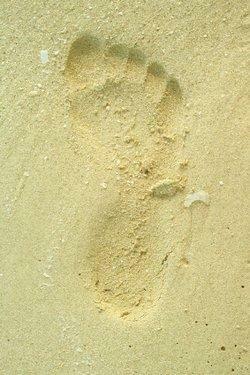 The creature is extremely shy of humans, and the only evidence it ever seems to leave behind are a few large footprints. There are many bigfoot photos in circulation that people claim contain images of this creature. In most cases, the quality of the images is too poor to be certain what they show. Some are little more than a dark shadow in the woods with a vaguely human/ape outline. Other bigfoot images show clearer images of a large hairy creature that could be an unknown member of the ape family. Each photo that surfaces is hotly debated and scrutinized, yet none have ever been fully endorsed by the scientific community as undeniable evidence that bigfoot is more than a myth. Here is a selection of bigfoot photos for perusal. View them and draw your own conclusions about their authenticity. Patterson/Gimlin photo: Taken in 1967, near Bluff Creek in northern California, this is perhaps the single most famous photo of the alleged creature. 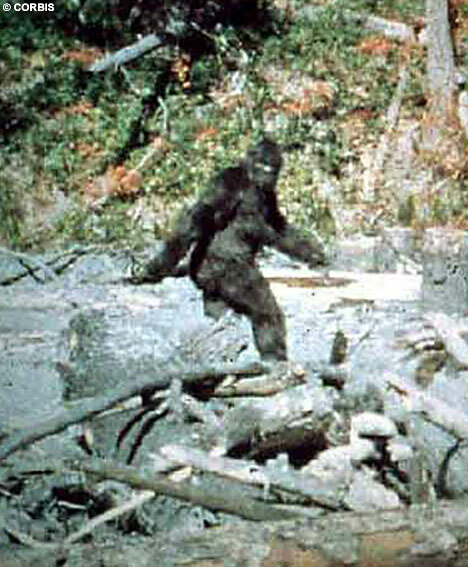 The still shot is taken from a 16mm film that shows the bigfoot on the move. This image has never been definitively debunked and remains strong evidence in favor of the existence of the species. Annette Crews photo: This image was captured around 1992 near Morton, Washington. Crews originally thought it was a bear, but stated that the animal continued to walk downhill in an upright position. The following 2007 images were captured by hunter Rick Jacobs near Ridgeway, Pennsylvania. Image one shows an ape-like creature believed by some to be a juvenile sasquatch. Image two shows the creature fully bent over. The most recent chapter in the bigfoot saga comes from the state of Georgia where, in August of 2008, two men announced that they had actually collected the body of a dead sasquatch.Matt Whitton and Rick Dyer, who run their own bigfoot tracking business, claim they found the carcass in the woods and proceeded to bring it out while being watched by two other live bigfoot creatures. They said they transferred the carcass to a freezer until they could decide who to contact about their find. Finally, they decided to call Tom Biscardi, radio host and self-proclaimed bigfoot expert, who helped orchestrate a press conference for the event. To date, few people have actually seen the "body" beyond these three men, but initial results of DNA samples have indicated human and possum genetics. Biscardi promises an autopsy will follow. Photos of the bigfoot carcass litter the Internet, but can be viewed along with a press conference video at OurBigfoot.com. The still image shows what appears to be a large and decomposing ape man packed into a floor freezer unit. While Whitton, Dyer and Biscardi claim it's the real deal, some people believe it looks like an ape costume with some animal entrails thrown on top. Update: It turns out this chapter in the bigfoot saga was definitely a hoax. When the "body" was thawed, it indeed turned out to be a costume. Whitton and Dyer are reportedly laying low. According to Police Chief Jeff Turner, Whitton is in the process of being fired from his position with the Clayton County Police department for perpetrating a fraud on the public. Mark this down as another stunt that detracted from the genuine search for evidence of a new species. Unless solid evidence of a bigfoot body can be produced, the search for this elusive creature goes on. Is there a large ape-like cryptid lurking in the vast woodlands of North America? The jury is still out, but it's almost certain more bigfoot photos will surface in the years to come, just as they have for decades.